We love getting this question, because measuring real impact is the most important part of a nonprofit’s work. That’s why our full-time evaluator conducts rigorous qualitative and quantitative assessments of our programming year round. This data allows us to make nimble, participant-informed improvements in real time, craft smart and strategic long-term goals, and track the ongoing impact of the Bridge Builders experience on our alumni into adulthood. 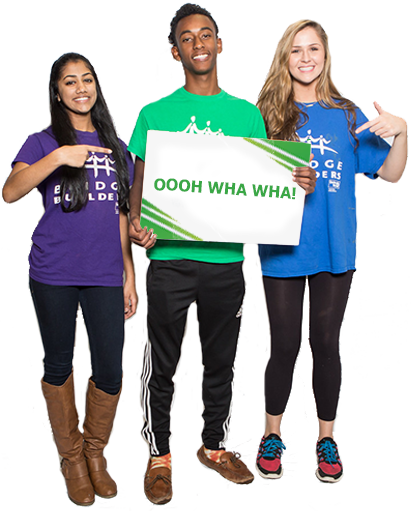 The Bridge Builders® program is experiential, relational, and transformational. Our activities are built around an experiential learning cycle that begins with a hands-on experience and progresses through a series of debriefing questions that allow students to reflect on what they just did, what they learned, and how they can apply these lessons to their lives. Bridge Builders’ curricula are also based upon experiential education standards that ensure the programming is significant (it has meaning and relevance for the participants), challenging (it provides new experiences, encouraging “out of the box” thinking), supportive (it emphasizes teamwork to develop trust and healthy risk-taking), satisfying (it builds on successes to create even greater successes) and fun (it capitalizes on the inherent joy of learning while laughing). 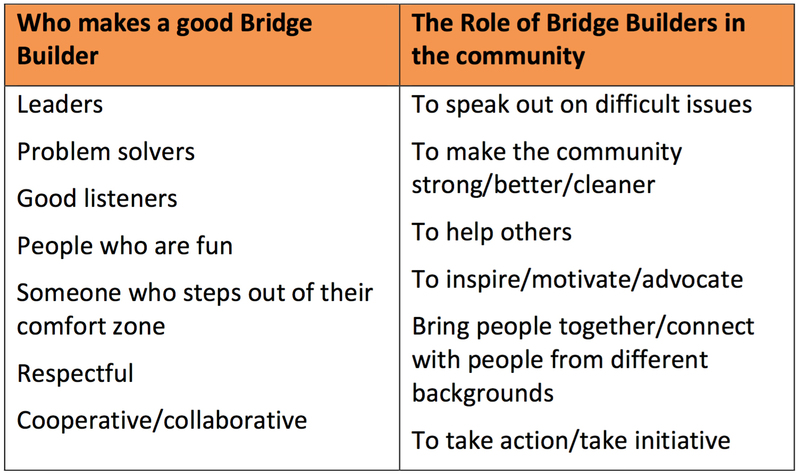 Top Bridge Builder qualities, as identified by program participants themselves. In addition to serving adolescents’ need for healthy risk-taking, Bridge Builders programming provides a sense of community, strong supportive relationships with peers and adults, opportunities for youth to participate in decision making, and an engaging and challenging environment in which they can learn. 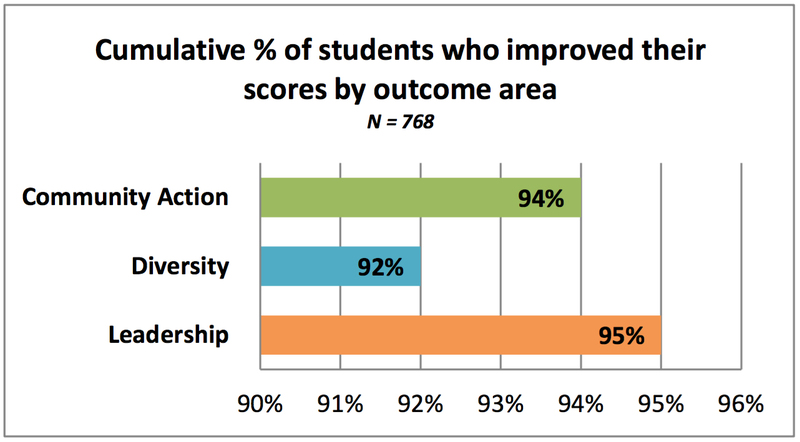 Program results show that students who experience this model leave with the skills and language to courageously address challenges, adversity, and fear, and as a result have a renewed commitment, experience meaning in their life, and aspiration for their future. In tracking our students’ experiences in the program, BRIDGES focuses on three core outcome areas: leadership development, diversity appreciation, and community action. As reported by Bridge Builders COLLABORATE students in the 2016-17 program year. BRIDGES strives to provide high quality data for continuous improvement within the organization and community, so we employ several qualitative and quantitative data collection methods in order to provide a holistic perspective on our outcomes. When feasible, real-time, data-informed adjustments are made to programming in order to enhance student experiences. Questions about our methodology and outcomes? Contact BRIDGES Evaluation Manager Jesse Davidson.